Maryland state law requires that funeral homes deposit of minimum of 80% of preneed Merchandise and 100% of preneed Service funds into a federally insured banking institution. We, as a practice, deposit 100% of all monies for preneed accounts. Rausch Funeral Home funeral directors are also licensed life insurance agents, who work with National Guardian Life Insurance Company to pre-fund arrangements using life insurance policies. This options reduces the financial reporting responsibilities of the insured as the interest generated on these policies is not considered a taxable asset by the IRS. For more information about using life insurance to fund pre-arrangements, contact us. When an Irrevocable Trust Agreement or Revocable Trust is established between the funeral home and the purchaser, the monies are escrowed in an account under the purchaser’s Social Security Number in Trust for Rausch Funeral Home, P.A. These funds are considered an asset to the purchaser regarding government benefits and taxation. Rausch Funeral Home mails IRS 1099 forms to each account holder annually for use in preparing tax returns. This form is a statement of interest earned during the previous year on pre-need accounts held in trust. All monies in an Irrevocable Trust belong to the purchaser and are intended for their burial purposes only. These monies cannot be refunded to the person at the time of death, but are portable and therefore transferable to another funeral provider, who is not obligated to honor the terms of the original contract. When a fully funded pre-planned funeral contract has been signed, no further monies will be required to cover items listed on the Statement of Goods and Services Selected. 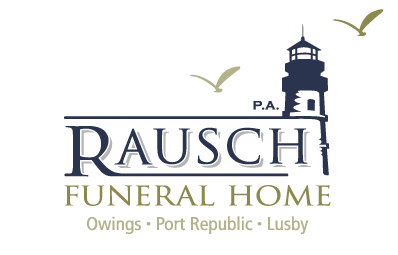 If at the time of death the family wishes to add merchandise or services not included on the original agreement, they will be added at the current prices as detailed on the active General Price List for Rausch Funeral Home. Any person wishing to transfer their preneed funds to another funeral home, in or out of state, is entitled to 100% refund of their initial funds and any interest the account has earned.